Here is another pic of my fantastic Smokey! 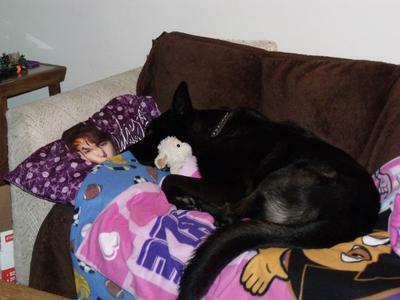 I must admit that I am a little ashamed that my big, bad, beautiful, black German Shepherd seems to be a bit of a Justin Bieber fan and likes to cuddle with my daughters stuffy. My kids like to sleep in the living room on weekends so they can stay up and watch tv and I guess ol Smoke likes it too. I hope you all like the picture and Ill try to send more later. Smokey looks so comfortable on that couch. What a beautiful German Shepherd! German Shepherds are an amazing breed so protective,loyal and loving. Take care of Smokey and he will take care of you!